EWF1 is a wonderfull device for fire protection at home. 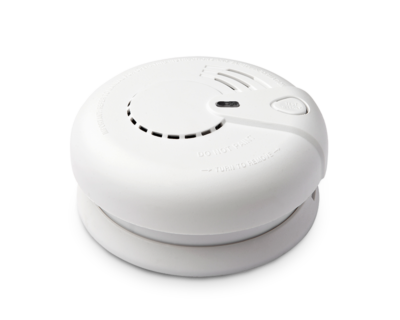 Meet the fire protection regulations with this easy-to-install wireless smoke detector from Eldes. EWF1 is extremely simple to install. Remove the sticker from the battery and add the device to the security system with one click. Mount the EWF1 to the wall or ceiling with 2 screws or a duct tape. It has never been so easy! Fires burn faster today. It takes only 3 minutes because of the materials furniture is made off. EWF1 is designed to detect smoke before the fire starts. The detector immediately sends alert to Eldes alarm panel about the potential fire danger. The built-in siren warns users locally not to miss the alert. If you want a full protection not only from the fire, but from the carbon monoxide, choose EWF1CO with additional possibility to detect carbon monoxide. 1. Remove the battery from EWF1/EWF1CO. 3. Insert the battery back to EWF1/EWF1CO. 4. Hold the RESET button until you hear a short beep. What battery should I use for replacement? We strongly recommend using EVE CR9V-P, Energizer LA522 battery or Ultralife U9VL-J 6F22.